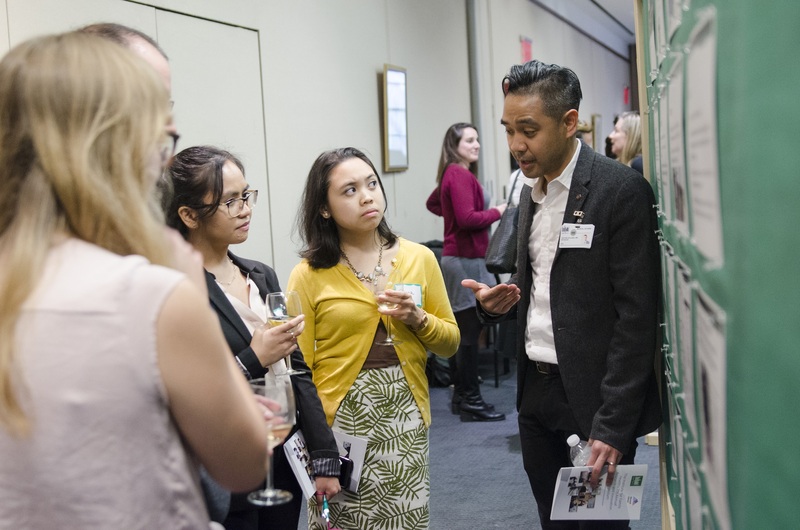 Every spring, the Institute hosts the Research & Innovation Symposium, where staff, students, and organizational partners showcase their projects in clinical and community innovation, continuous quality improvement, and scientific inquiry. The 2018 Symposium’s theme of “Advocacy” illuminated the scholarly activities disseminated at the Institute over the years that have gone on to directly influence clinical care, health systems improvement, and public health policy. Research Award: “A Comparison of Tricyclic Antidepressant Prescriptions between Patients with and without Identified Suicidal Ideation” by authors Anna Blazejowskyj, BS, Virna Little, PsyD, Abigail Herron, DO, and Andrea Cole, PhD. Continuous Quality Improvement Award: “You Are Not Alone: A Group Intervention to Increase Confidence in Safety Planning” by authors Warren “Jay” Pires, LCSW, Sarah Bernes, LMSW, MPH, Marianne Goodman MD, and Deena Levine LCSW. Innovative Projects Award: “Implementation of Interconception Care Screening at Well Child Visits: Developing a Successful Workflow for Family Health Center Staff” by authors Aimee Mankodi, MD, Katrina Organ BA, CLC, and Sabine Shaughnessy BA, CLC, & “Hepatitis C at W 17th St Family Practice: Identifying population needs and proposing a clinical workflow” by authors Meg Glausser, MD, Regina Ginzburg, PharmD, Shireen Farzadeh, PharmD candidate, You Jin Chang, PharmD Candidate, and Michelle Bejar, MD. People’s Choice Award (selected by open vote): “You Are Not Alone: A Group Intervention to Increase Confidence in Safety Planning” by authors Warren “Jay” Pires, LCSW, Sarah Bernes, LMSW, MPH, Marianne Goodman MD, and Deena Levine LCSW, & “HIV Stigma Reduction at the Institute for Family Health” by authors Rebeka Glushefski, LMSW, Rebecca Green, LMSW, Andrea Cole, PhD, LCSW, Robert Murayama, MD, and Mary McGrath, BA. View all 2018 Symposium presentations here. All Institute staff and trainees are invited to participate in the Symposium – look out for announcements each fall. Harlem residency faculty Dr. Santa Ana presenting his innovative project to Mount Sinai medical students at the 7th Annual Research and Innovation Symposium.